German Films: Film Info: L'CHAIM! - AUF DAS LEBEN! Chaim Lubelski is a Jewish scholar, was part of the jet set of St. Tropez and a successful businessman in New York. At 63, he moved to Antwerp to live with his mother – a concentration camp survivor – taking care of her, day and night, with true love and joy. 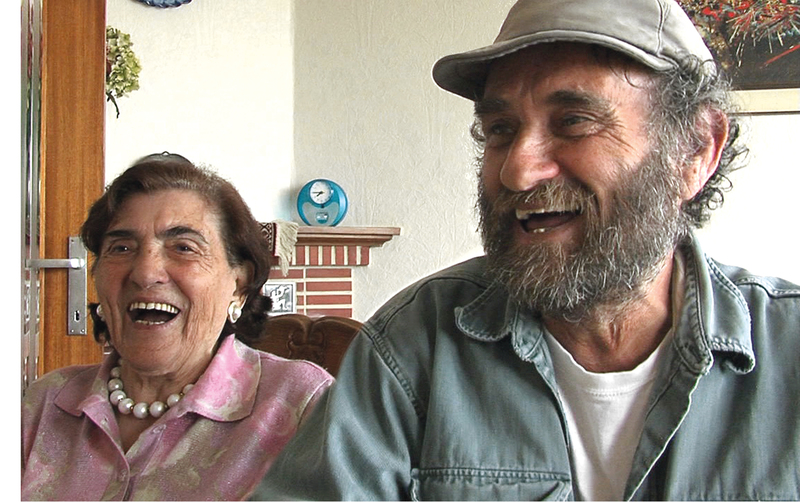 In his feature documentary debut L'CHAIM!, director and producer Elkan Spiller introduces us to his eccentric and charismatic cousin, whose non-conformist life, as a second-generation survivor, is deeply affected by the Holocaust and its traumatic aftermath. A life full of absurdities and tenderness, which, like Spiller’s film, breaks with every cliché. Elkan Spiller was born in Cologne in 1963. As the son of Holocaust survivors, his interest in Jewish history was sparked at an early age, and he went on to write his Master’s thesis on the topic of anti-semitism in German television at the University of Arts in Berlin in 1992. Since then he lived in New York, Tel Aviv and San Francisco and has been working as a freelance journalist German television broadcasters. His short film MAMA, L'CHAIM was screened at over 50 international film festivals and received numerous awards. He returned to Germany to shoot and produce L'CHAIM! - TO LIFE!, which is his feature documentary debut and had its world premiere in the Neues Deutsches Kino section at Filmfest Munich 2014.